We are excited to welcome Goldmark Resident Artist Benjamin Muñoz to the John H. Milde Gallery for his solo exhibition entitled, ¿Qué Más Quieres? The exhibition will feature most of Ben’s recent work including the complete works of The Endless Endeavor. Ben is a Texas based painter, print-maker, and art instructor. His work is often reflective of his heritage, upbringing, and current surroundings. Join Ben and friends for a reception and artist talk at the John H. Milde Gallery on Saturday, May 18, from 2:00 - 4:00 pm. The reception will take place during the May Art Walk at the Goldmark Cultural Center located at 13999 Goldmark Dr., Dallas, 75240. Ben's artwork will be on display April 29 - May 31. Saturday May 18th from 2-4pm. Songs inspired by space, time & love. The evolution of physics is synchronous with the evolution of visual art and music. Physics is about understanding space and time. Visual Arts reflect our depiction of space in both two and three dimensions. Music quantizes time, dividing sound into notes and measures. Throughout our history, themes and ideas converged, driven by the passion for discovery and expression. The paintings and music in this show (including songs by James Taylor, Leslie Bricusse, Paul Anka, Michel Legrand) represent a conversation about TIME, the dynamic evolution of physics. Saturday, March 9th from 2-4 pm. Please let us know if you will be joining us by RSVPing via the form below. Thank you for RSVPing for the opening reception of the “Prints, Prints, Prints” Exhibition taking place, Saturday, March 9th from 2-4 pm. Location: John H. Milde Gallery, Goldmark Cultural Center, 13999 Goldmark Drive, Dallas, Texas. We invite you to discover the printmaking exploration and expressions of the artists of the Goldmark Cultural Center. Coinciding with the National Printmaker’s Conference (SGCI-2019) in Dallas March 6-9, 2019. Exhibit on display January 7--February 28, 2019. To RSVP for the Closing Reception please fill out and submit the form below. Thank you for RSVPing for the Chain Stories Exhibition - Opening Reception & Art Talk. Opening Reception, Saturday, January 19th, from 2:00pm-4:00pm and Art Talk from 3:00pm-4:00pm. Exhibit on display January 7--January 31, 2019. Closing Reception - Saturday, February 23, 2:00pm-4:00pm (Art Talk 3:00pm-4:00pm). I became preoccupied with chains a few years ago as a metaphor for constraint and restriction. In Chain StoriesI I continue to regard them in a broader sense, not just in terms of confinement, but also as a means of attachment, support, adornment… connections made. In most works the chain motif is obvious. A few pieces refer to psychological/emotional/non visible connections. The links are implied, but surely as strong. Through portraiture and narrative I am looking at relationships and states of being, lessons learned and their impact on the self. Images are bound in frames or strung out as wall jewelry, or a combination of the two. Chain swags create dialogs about separation and attachment, or become wall necklaces with their own tales to tell. Free standing vessels, sewn and sutured, allow glimpses of interior, insular selves, safe and protected in hard shells. Placement and pedestals complete the story. 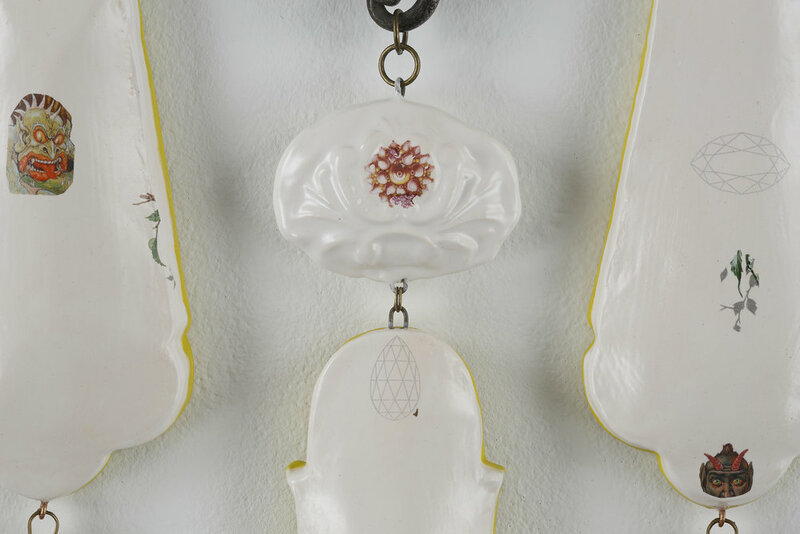 Swallows (foreground), porcelain, decals, nylon chain and opals, 2018, detail view. Catherine Cornelius was born in Louisiana and spent her childhood in North Carolina and Chicago, Illinois. She graduated from the University of North Carolina, Chapel Hill, with a Bachelor of Science in Business Administration. Moving to Dallas, Texas in 1979 she worked in the corporate world until retiring in 2016. She began studying and making art in 1991 in a variety of disciplines, but ultimately focused on ceramics. Catherine’s art education includes Brookhaven College, the Craft Guild of Dallas, and Penland School of Crafts. Her passion for the arts lead her to establish Gallery 2520 in Dallas (2001-2006), a gallery conceived to offer emerging artists an affordable exhibition venue. Catherine has served as a board member for the Texas Clay Arts Association and the Dallas Contemporary. Her work is exhibited and sold in Texas and North Carolina. She lives in Boone, North Carolina.